1 LCDCS - Frame indicator, a 5V digital line that is normally pulled high. 1 LCDCL - Clock line, a 5V digital line that is normally pulled high. 1 LCDDI - Data line, a 5V digital line that is normally pulled high. Once the SX2 mill (or SC2 lathe) is turned on, a blip of data is sent over the LCDCS, LCDCL, and LCDDI lines every 0.75s. This blip will hereby be called a packet. Around August 2014 Sieg Industries added a 36 bit header to the start of each packet. Prior to this time no such header existed. Following this header (if present) are 4 frames. Each frame start is indicated by the LCDCS line being pulled down. The frame ends are indicated when this line is pulled back up. Each frame consists of 17 bits of data. A bit is read by reading the state of the LCDDI line on every fall of the LCDCL line. 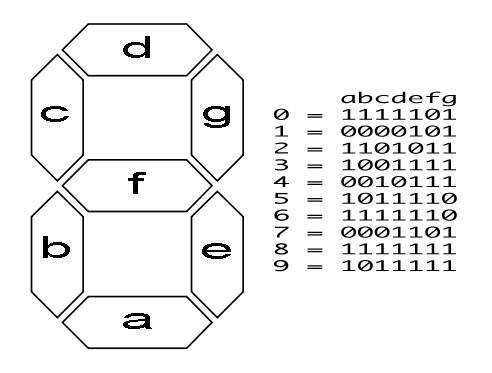 The first 8 bits of each frame represent the address of the frame. The following 9 bits represent the frame's data. The SX2 Mill only uses 4 addresses and always transmits them in the same order (0xA0, 0xA1, 0xA2, 0xA3). These addresses respectively indicate the 1000's rpm digit, 100's rpm digit, 10's rpm digit, and one additional register which the SX2 mill always transmits with a value of 0x20. The next 7 bits identify which of the 7 segments of the digit should be turned on (1) or off(0). An image below describes what bits toggle what segments. The 9th data bit is always 0 EXCEPT for when the spindel is not rotating. In this scenario, the 10's place digit's final bit is 1. If you found this project interesting or helpful and have the means feel free to donate! CNC builds are expensive! 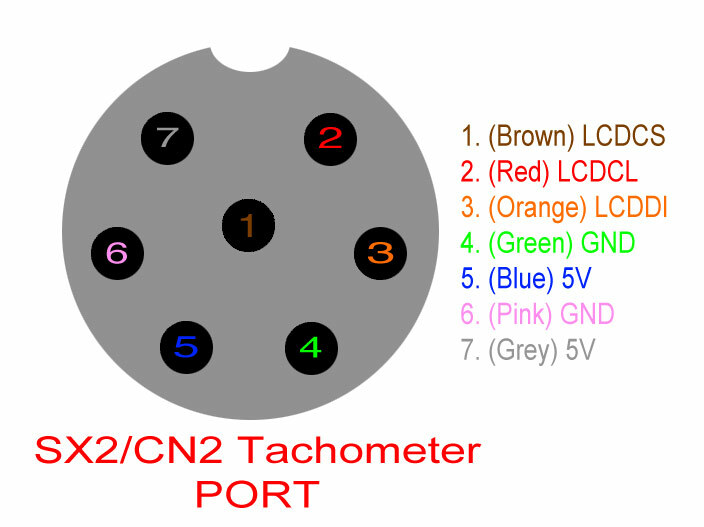 One question: port pins image is as looked from outside (the connector mounted at the panel)? BTW, the connector for the cable is GX16 type 7 pole female. Admin: This view is of a person looking directly into the plug on the back of these machines. I've seen those connectors sold as mini din 7-pin, xlr 7-pin, and now this one which I had not heard it called by before. Thanks!